(SPOILERS) I should probably have caught this ages ago, but instead I just let it go. Does Frozen mean something extra in terms of quality, or have added resonance, because it turned out to be such a huge hit? After all, whilst it was generally well reviewed, no one anticipated the movie as the enormous crowd-pleaser and cultural phenomenon it became. Talk comparing it to the Disney renaissance, which included a Best Picture nomination for Beauty and the Beast, can only account for it being a hearty success, not one of this magnitude. Surely this was just the latest in a long line of reinvented fairy-tales, sticking closely to the formula of the retitled mix-up with a modern sensibility that was Tangled? A good, solid, sassy, smart update, but nothing really ground-breaking. Clearly, though, it struck a major chord, which is why so many column inches have been devoted to analysing and debating its particular merits and its political and/or sexual mores. But that doesn’t de facto make it a greater or lesser beast. Frozen is a good movie, and (obviously, John Lasseter exec-produced it) an extremely well-made movie, with a central relationship that is affectingly, if obviously, played out (at least until the smart twist on classic reversals that come with enchantments), but I’d be hard-pressed to argue its case as the best thing since The Little Mermaid ushered in a new age of animation in 1989 or one that nuzzles comfortably with the best of Pixar. Of course, the best of Pixar is now an increasingly distant reflection in cinema’s rear view mirror. Frozen was released at the tail-end of a very average year for animation, one in which nothing from the major studios pushed the boat out in terms of creativity or originality. 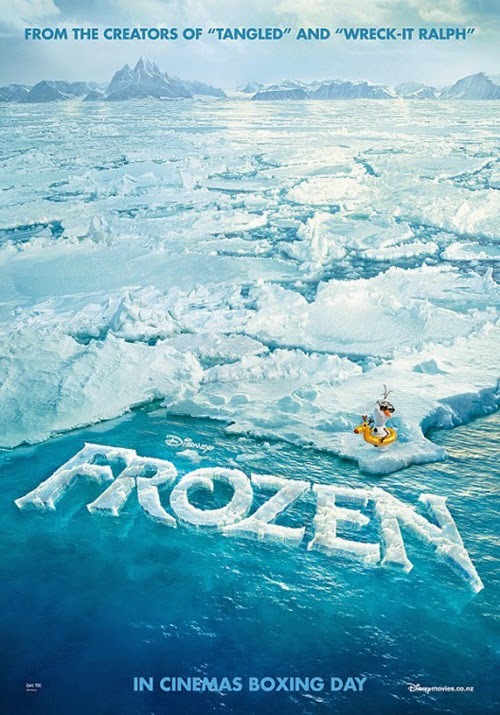 Even given the positive advanced word, Frozen shouldn’t really have been much different. An adaptation of Hans Christian Anderson’s The Snow Queen had first been mooted as part of a biography of the author back in 1937, then failed to take flight in the 1990s before being re-embraced post-Tangled. Even then, it took Lasseter to steer it from the traditional tack of a villainous Queen towards something more nuanced. If the ‘power of love” message of the original story remains intact, the conversion from a traditional boy-girl focus to that of estranged siblings is revealed as a surprisingly potent and accessible one. Hey, if only Disney had known there was this much money to be made from sisterly strife! Cue numerous imitators, none of which attain a sliver of Frozen’s impact. I’m not sure there’s any other straightforward way to explain the success. You can cite the songs, which apparently are recited ad infinitum by young moppets to the distraction of any in the vicinity, but they aren’t going to get on board with them if they don’t care about the central relationship. Speaking of moppets, I wasn’t overly convinced by the opening passages of the picture. The attempts to establish the setting stumble somewhat, overloading with cutesy kid versions of Anna and Elsa, concerned parents and wise trolls (wise trolls? Now that’s an inversion). Understandably, writer-directors Chris Buck and Jennifer Lee are trying to get to the point where the story proper begins as quickly as they possibly can. Yet this seems to consist of Anna (voiced by Kristin Bell) knocking on sister Elsa’s (Idina Menzel) bedroom door for about a decade, to no avail. Parents are dispensed with in the blink of an eye and before you know it, it’s Elsa’s coronation. From here, up to and including Let It Go, the picture is at its most vital and that’s wholly down to the focus on Elsa. It’s not quite a stroke of genius, but nevertheless a fairly perceptive one, to evoke sympathy for the traditional villain (it seems Disney’s attempting something of that ilk again with Malificient, but I haven’t seen it yet to comment; still, there’s another fairy tale villainess who has gone great guns when shown to be simply misjudged), and Elsa is a much more interesting character than Anna. At this point it appears all the fears presented by her parents, the trolls (Ciaran Hinds as their king), and most of all herself are actualised; that hiding one’s true nature is best. And maybe it isn’t so bad; she is granted a glam makeover, like the lead singer of Roxette only with more hair. It’s only later that the theme of love conquering crystallises (still, what this means for the next time Elsa’s emotions are piqued, Carrie-like, is left unexplored; probably best to wrap things up while the going’s good). Her flight from the palace, to the cries of “Monster!”, evokes Frankenstein’s unsympathetic villagers and so encapsulates the misunderstood innocent theme. It’s one Disney is usually far too black-and-white to get behind, no matter how hip and jive they makes the surface baubles. Let It Go is a decent tune; the only memorable one in the movie (sorry to all those who have been cursed with recitals of the entire repertoire, so proving me wrong), in a Eurovision power ballad kind of way. It has a lot of gusto, and gusto is good, and more importantly it doesn’t fall into the typical musical trap of half-arsed spoken songs where the tune seems like an afterthought to the plot-advancing/thematically-burdened lyrics. Most importantly it has emotional clout; fear and repression can be dispensed with in Elsa’s solitary retreat, but loneliness must also be wholly embraced. Everything else here sounds like typical Disney song writing maths, right down to the chipper Snowman number. What of the suggested subtext of coming-out versus repressing one’s sexuality? It’s an easy-to-appreciate interpretation (when shorn of the negative spin brought by the Christian evangelical movement), and it’s difficult to believe it didn’t at least occur to the directors (although they are consistently non-committal), but it doesn’t really hold up against the broader brush of being allowed to be who you are (indeed, it arguably gets a bit tricky if Elsa is positioned as the nominal antagonist; until she is accepted for who she is). Or of just feeling different; since most kids tend to see themselves at odds with the world at some point, Elsa’s situation has more relatability than Anna’s simpering virtue. Anna is pretty much your averagely typical modern Disney fairy princess. Even if she’s allowed to be headstrong and (ultimately) non-motivated by the desire for a mate, she is rewarded with a good strong honest-and-true partner for her pains. She can be a little shallow (getting engaged on a first date), but her good intentions are never in any doubt. We can see easily enough that the all-important act of true love thawing a frozen heart will be a case of misdirection in respect of Hans (Santino Fontana), so the double twist that it isn’t Kristoff (Jonathan Groff) either is a sprightly one. The hat trick is that neither is it Elsa called upon to express the love she holds within for her sister; Anna must sacrifice herself. Frozen manages to successfully subvert expectations in this regard at least, which is some achievement for a family movie. Anna’s act further emphasises the theme of self-empowerment; rather than receiving salvation and affirmation from another, it is giving that instils completeness (albeit, Elsa needs some small help along the way to actualising her feelings of self-worth). It’s about as responsible as a Disney moral gets. Still, making Anna more of a character in her own right might have been an added bonus; she only becomes so when reflected by Elsa; she’s so good and kind and pure, despite de rigueur attempts to make her forward and impulsive etc. So, when it all comes out in the wash, this still manages to be a wholly traditional piece. The Queen isn’t rewarded with a partner; she has to make do with platonic love. Anna gets the prize for undiluted wholesomeness. Even the reveal of the villain isn’t all that subversive. Hans’ unveiling as the bad guy seemingly comes out of nowhere. One might suggest it’s a neat but unsubtle commentary on the Prince Charming myth; but Anna don’t need him since she’s a princess already. She can afford to opt for a whacky guy who talks for his reindeer. To be fair, this also signifies the roots of the story wherein Anna ends up with the simple peasant lad since she wasn’t a princess in the first place (but we’re all princesses in Disneyland!) Hans’ turnabout is more understandable in context; the script changed from not featuring him at all, to his being there but not a villain, to becoming an outrageous psychopath. The final choice works thematically, and it’s clear the writers had figured out and justified it, but as delivered it’s a bit Scooby Doo. As ever, the comic relief is note-perfect. This is probably because most animators’ hearts lie with the fun, properly “cartoonish” characters they grew up drawing. The downside of this approach is something like the expertly crafted but one-note Get a Horse! short that preceded showings of Frozen. It’s a nostalgic hearkening back to original Mickey Mouse hand drawn stylings mixed with up-to-date CGI, as the characters break through a cinema screen. But there’s nothing to it beyond the technical prowess, certainly not enough to take up six minutes (it isn’t a surprise in retrospect that it didn’t garner the Best Animated Short Oscar). In Frozen itself, the humorous goods are delivered by Josh Gad’s naïve snowman Olaf, a cavalcade of facile charm, “And I like warm hugs”. We also meet silent Sven the reindeer, who isn’t allowed to talk (Snowmen doing yakking is fine, but the line has to be drawn somewhere) so Kristoff has to do it for him. It’s a sign of an undernourished animation if the funny supporting turns become the sought after respite from unengaging leads or a drowsy main narrative (a prime example of this is the Ice Age series, with Scrat valiantly keeping the boat afloat). In Frozen the laughs have their place and aren’t required to do more than their fair quota. Wikipedia reels off a string of box office figures telling you how Frozen is just about the best of the best, including the highest grossing animated feature ever worldwide. A stage musical is imminent and no doubt Frozen fever will pervasively consume theme parks shortly, if hasn’t already. It’s the aftershocks that appal; one only has to dip into the (limited) extras on the Blu-ray release to be greeted by the sickeningly upbeat Disneyfication of every element, from an all-singing, all-dancing “Making of” to the deification of dear old bigot Walt himself. There has been reticence over plunging straight into a sequel, which might be regarded as an indication of standards until one considers the usual Disney practice is to churn out straight-to-video knock-offs so bypassing expectations of quality. Lee at least wants to make something different; she’s working on the screenplay of A Wrinkle in Time. So what makes Frozen so special? Is it really so much better than Tangled? Or the underrated Brave? Without the benefit of being one of the target audience I’d say no. But then, like Dr Evil, I may have been partially frozen. Perhaps it’s down to the slap in the face to traditional “good” heroines (although it still has one). Maybe it’s the universally recognised sibling tension (which can extend to any BFF of course, if you’re an only child). Disney have a handle on livening up their fairy tales, but Frozen explores something that is likely extra-normative; Brave couldn’t muster the same repeat visits for its mother-daughter relationship (and okay, it wasn’t a musical either). Nor Tangled for its essentially trad-romance. One thing is certain; if the Mouse House could put this animated alchemy on tap, they’d be pouring out a Frozen every year.